Good grief, when will Spring finally get here? I’m still wearing my fleece jacket at work and bundling up the kids for school in the morning. One bright spot of Spring is a window valance that I completed last week. Well … completed … just means that I have the top done. 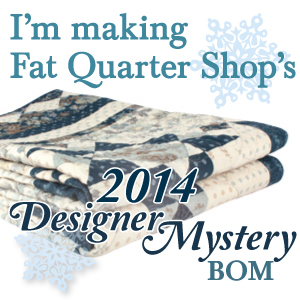 I need to actually QUILT it … Picky, picky. I was inspired by a post from Sherri McConnell of A Quilting Life (click here to see it). She had taken the pattern by Fig Tree Quilts called Canned Pears (you can buy it here!) and made a wall hanging. I looked at it and thought that it would also play well as a window valance in our kitchen – but I liked the look of the offset pears in the main pattern. I scaled down the pattern size about a third to make it fit 5 pears with a mini-charm border. The whole thing ended up around 40″ x 18″ (roughly). All of it was made with the Mirabelle collection by Fig Tree, with just a few squares of Honeysweet in the top border row. Here is my old window covering. Very, very sad. It is a just a twin sheet we had that was folded and clipped up to a cafe rod. AFTER: New, custom Fig Tree Window! The lighting in my kitchen is really bad for this – so just take my word for it that the colors are bright, springy and wonderful! I already have the backing, just need to layer and quilt. This is my first project for the home that isn’t a standard quilt. I’m so glad I took a chance! Thanks for visiting! See you soon! It looks fantastic. Well done. Love this project! A wonderful way to bring spring to your kitchen. I love your new kitchen valance, Jennifer! Have you decided how you will quilt it? I love your version as a valance! I really adore your scalloped trim too! Making a valance out of that pattern was genius! I bought the kit from Fig Tree, and love that fabric line, Mirabelle. Those pears are the sweetest, aren’t they? This is a great idea! The valance looks good in your kitchen and we can only use so many bed quilts after all.